Case 128 – Top DONE!! Yesterday seemed to drag progress wise .. All I had managed to get accomplished yesterday was the top and bottom pieced border, plus get the wide border cut out. I had a dilemma of sorts yesterday. I discovered that AMC was playing “The Untouchables” with Kevin Costner, Sean Connery, and Robert De Niro last nite .. I’m a HUGE HUGE HUGE Sean Connery fan and I used to watch the original Untouchables TV series with Robert Stack (I think that’s his name) when they were re-run late at nite many years ago and had never seen this version .. so I wanted to watch it .. 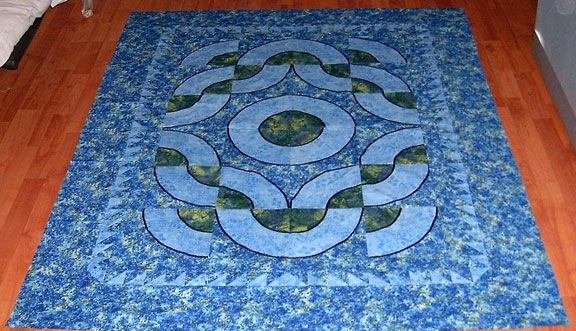 So that rather put the finishing of this quilt off until after that movie .. oh geeze guess what was on afterwards??? The Invisible Man Returns with Vincent Price .. I’m a HUGER Vincent Price fan than Sean Connery .. so that rather tore any more progress on this quilt .. but I did work on my hoodie or not while I was watching these movies ..
Today was a new day as they say .. Oh I did measure it up and average what I would need for my borders .. Now this quilt was square before I put the pieced border and something I did with that, wonked my quilt .. – am still trying to figure out what I did to goof THAT up .. I am sooo glad that I had that outer border for one last square attempt. I had to laugh at your dilemma about piecing borders vs watching Sean Connery. The Untouchables is one of my all time favorite SC movies – my very favorite (and one of my all time favorite movies ever) is “The Man Who Would Be King” with him and Michael Caine. If you haven’t seen that – catch it sometime… It’s from the mid-70’s and I didn’t have a clue who Sean Connery was, as I wasn’t a 007 fan. And rest assured, The Untouchables was what I was watching last night, as well. And I believe you are correct about Robert Stack in the original! Grace once again you have solved a marvelous quilt pattern. I love the fabs you picked, this is a great eye-candy. I think you should send it to IN and not Texas. Sorry Bobbie, IN comes before TX flying south from Canada, at least the last time I looked on the map. You go girl, do your thang!!! Gracie, absolutely delightful eyecandy for these old eyes! I thought about how to make that sawtooth border pop out — have any black twill tape left? But…I like it like it is and I’m with Bobbie on this one–we will draw straws to see who gets it to languish on whose veranda, that is IF you decide it needs a new home! LOL JK I know you will have it on your bed prettily displayed in good time! Oh, and congrats on the Guest Blogger! WooHoo!!! I like the *quilting the snot out of it* plan. 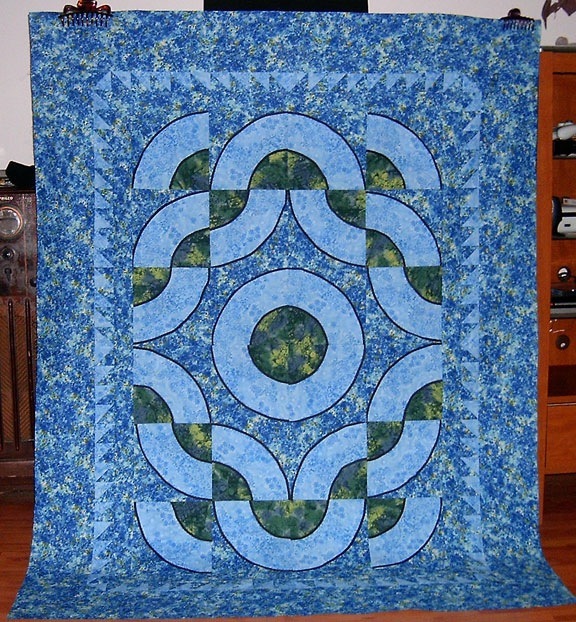 It does look nice and flat with no wavy edges so I’m sure you did a good job of taming that pieced border.